All rooms in the house are comfortably large. The conservatory, very much old fashioned rather than Homes and Gardens looks over the garden to the canal and hills. There's a good wood burning stove and a refectory table for 8. It is usually the breakfast room, ideal also for simply sitting and watching the birds, reading or talking. The garden has a south facing terrace and lawn leading to the canal and views to the other side of the valley. The front lawn looks across fields and the canal to the west, and the evening sun. 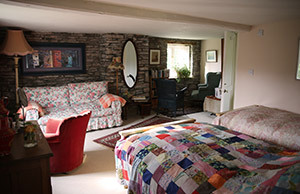 The sitting room on the ground floor has armchairs and a big woodburning stove, sofas, pictures, books, games and a piano. 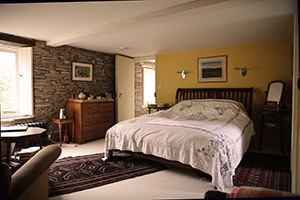 On the first floor there are two en-suite double bedrooms. Room one's brass and iron bed is 4' 6" wide and the bathroom has a bath and separate shower. 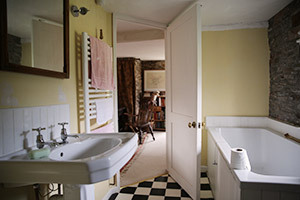 Room two has a 5' wide bed but with a shower attachment on the bath rather than a separate shower. 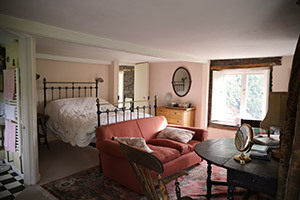 Room three on the second floor is twin bedded and the en-suite bathroom has a bath and separate shower. Room 4 is slightly smaller, still with a queen size bed. There is a shower separate to the bath. All rooms have armchairs and a sofa. Because the Storehouse was built with no internal walls to allow grain and wool to dry, sounds from the bedrooms do carry despite our best efforts to soundproof the building. It's not ideal for frisky honeymoon couples.